Pesikta de Rab Kahana connects this passage to King David: "At midnight I will rise to give thank to You because of your judgements of mercy" (Psalm 119:62). "R. Phinehas said in the name of R. Eleazar bar R. Menahem: What did David do? He used to take a psaltery and a harp, put them at the head of couch, and rising at midnight would play upon them. Thereupon the studious in Israel, upon hearing David's playing, used to say: 'If David, the king, occupies himself at midnight with Torah, so much the more should we.' And so it turned out that all in Israel occupied themselves with Torah." (Piska 7:4). In another psalm, attributed to David when he was hiding in the cave from King Saul, David says, "Awake my glory; awake harp and lyre; I will awaken the dawn!" (Psalm 57:8, NASB). David declares that he will not wait for the dawn to awaken him, but by being awake and praising G-d he will awaken the dawn. To borrow Rav Sha'ul's words, he will "use the time well, for these are evil days" (Ephesians 5:16, CJB). Not knowing what the day might bring as Saul's men pursued him, always on the move, David made the most of every opportunity to praise G-d and spend time in His presence. When the time came for Yeshua to be arrested, after His last Pesach meal with His disciples, Yeshua took the disciples out to the Garden of the Wine Press. There He told them, "My anguish is so great that I feel as if I'm dying. Wait here and stay awake" (Mark 14:34, GWT). He went a little further and prayed but, "He went back and found them asleep. He said to Peter, 'Simon, are you sleeping? Couldn't you stay awake for one hour? Stay awake and pray that you won't be tempted'" (vv. 37-38, GWT). After a good meal and at least three cups of wine, it must have been difficult to stay awake. Yeshua went and prayed again but, "He found them asleep because they couldn't keep their eyes open. They didn't even know what they should say to Him" (v. 40, GWT). Yeshua wanted the disciples to stay awake and pray because midnight was approaching and they needed to be awake to witness His arrest and to be aware of what was going on, to be prepared for what was about to happen to Him. Not everyone can be awake at midnight or before dawn every day, but there is a principle involved here. 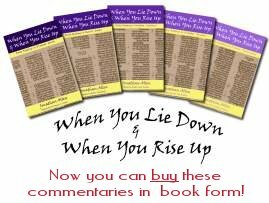 Rav Sha'ul, alluding to several passages from the prophet Isaiah, writes, "Get up sleeper! Arise from the dead, and the Messiah will shine on you!" (Ephesians 5:14, CJB). In the letter to the Thessalonians we find: "Let's not be asleep, like the rest are; on the contrary, let us stay alert and sober" (1 Thessalonians 5:6, CJB). Rav Sha'ul has been talking about the return of Messiah Yeshua, "the Day of the L-rd" that will "come like a thief in the night" (v. 2, CJB) when people are not expecting Him. But we, just like our people about to leave Egypt over 3,500 years ago, have been given our orders. As we killed the lamb, daubed the blood on the doorposts and lintels of our houses, there must have been a growing excitement among our people; then we ate the roasted lamb in haste, with our robes tucked up ready for travel - "We're leaving Egypt tonight!" - and who could sleep, surely only the younger children. Then, before dawn, so early that we had to take our kneading troughs full of dough on our shoulders for want of time to bake it, we were off - following our G-d into the desert on the way to the Promised Land. "Since we belong to the day, let us stay sober, putting on trust and love as a breastplate and the hope of being delivered as a helmet" (v. 8, CJB). Application: Do you struggle with the - "yawn" - sameness of Pesach each year? If so, then shake yourself awake and use this time to connect with G-d at this important season. Set aside time during the week to praise G-d for the miracles He did for our forefathers; the miracles that He has done for us in Messiah Yeshua; and the miracle that He is yet to do for all those who believe and trust in Him at the Last Day. 02Apr07 14:57 Jonathan S: Interestingly enough, we are told by the Rabbis to relax and lean to our left at the Pesach table in recognition of our freedom - this in stark contrast to what the word of our Lord tells us about eating in haste, with our robes tucked into our belt. It is almost as if by being taken out of Egypt we, the Jews (note: not Israelites), have already received our freedom and redemption. We mistakenly think that by being moulded into a chosen people, we have somehow been elevated to a place where we will be taken up into heaven no matter what. The Ravs talk about the Neshema, the Jewish soul, which seems to hold some sort of mystical affirmation and credential that would seem to defelect the judgement seat! May it be that all Jews everywhere tonight remember the might & Grace of their God to bring them out of Egypt, but also to remember that the Jewish identity was moulded through the injunctions and commandments they received in the Sinai desert. That Moses their great leader made it clear that there were blessings and curses associated with those commands, and that the man that heeds the word of God, will live by them!